Just like apples are rich in things that are good for you like vitamins A, B, C, E, and K (and fiber! ), so this letter identification page is rich in letter a’s. 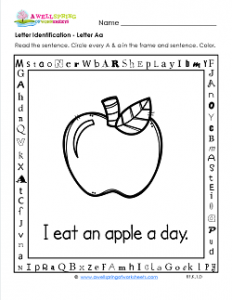 Your kids will find 12 in the frame (three on each side) and a whopping five in the sentence, “I eat an apple a day.” Finding all 17 letters should keep your kids busy for at least a few minutes. They can also look for a hidden sight word. Just so you know, it’s the word “play” and it’s across the top of the frame. Have kids color the apple.